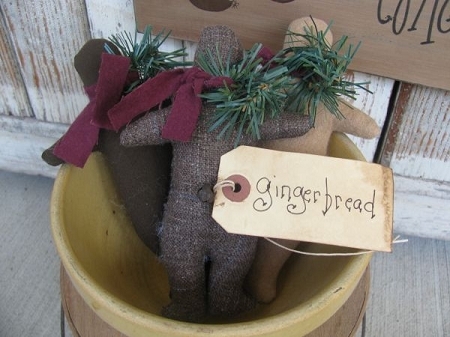 Primitive Gingerbread Bowl Fillers Set of 3. Mom makes these handsome little fellas, and I have to say, the picture does not due these justice. They are wonderful. She's made them from various brown wool and vintage fabrics. You'll get the set of 3 and a primitive tag. The sayings vary slightly. Also, the greenery that is tucked in their scarves can easily be removed if you want to use them for year round display. The greenery is not glued on. They are a nice size to display. Sizes are 9"x5" each.